I have attended the 9th Internet Governance Forum in Istanbul, which is a body that arose from the World Summit on the Information Society (WSIS) in 2005, and which has the stated aim of discussing “public policy issues related to key elements of Internet governance to foster the sustainability, robustness, security, stability and development of the Internet”. 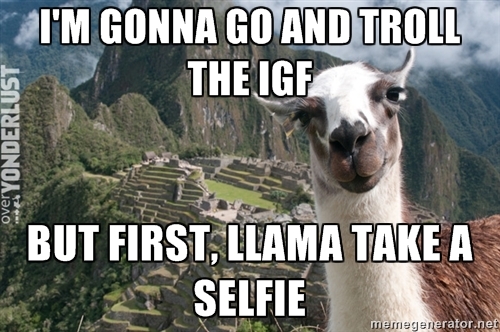 The IGF is one of the bastions of the multi-stakeholder model, so it was perhaps not very wise of me to go on record in one of the sessions that I do not believe in the multi-stakeholder model. A collective gasp filled the room. This statement requires some background; The comment came as a reply to an excellent and provocative question from a member of the audience, who asked the panel whether we believed in the multi-stakeholder model, and if so if we should abolish organisations such as WIPO and replace them with multi-stakeholder institutions. The intent of the question was clearly to encourage discussion and debate about governance models. But I decided to take the bait, answering that in fact I do not believe in the multi-stakeholder model. Legitimacy. Who is legitimised to take part ? The ethos of the multi-stakeholder system is that those with an interest in the subject have a right to be represented in the decision-making process, but I found little sign in panel choice and in the participation process in many of the meetings I attended that gave me an idea that there is really any thought into why these people are there. It seems to be a case of taking anyone in who shows an interest, which is good until you consider that this means that there is no filter for participation, in which case there is a question of legitimacy; and to a lesser extent an issue of quality. Lobbyists as legislators. The participant lists at forums like the IGF and ICANN is filled with special interest lobbyists. The current multi-stakeholder model gives those people a voice that goes beyond that which is supposed to be given to them in a democratic setting. The lobbyists, for all intent and purposes, become the legislators. This could mean that the decisions reached are coloured by special interests. While this is a common problem in representative democracy, it seems to be a feature of the multi-stakeholder system. Cliques and elites. Every time I visit these meetings I cannot help but notice the contempt with which some industry representatives and envoys view many other users, particularly civil society. I always get the impression that real decisions are made elsewhere, and these get passed down to selected stake-holders to be approved. Mistaking attendance with participation. Self-explanatory. Slowness. Events like ICANN and IGF boast huge attendance. With growing number of stakeholders, we get little done. Lack of results. Discussion forums like IGF are useful, but one has to wonder if the huge cost of these meetings is actually justified. I am not talking only about monetary cost, but the amount of air miles that get used at ICANN must have an environmental impact. Those who make the real decisions are not present. I must have missed the NSA and GCHQ reps. I like the idea of the multi-stakeholder model, but I cannot shake the impression that it has blind spots, but most importantly, that it is useless against the real threats that the Internet is facing. Snowden has shown that we live in a dystopian reality of mass surveillance and compromised architectures, and no amount of discussion at the IGF or ICANN meetings will change that. On the contrary, by giving the semblance of openness and participation, some countries are able to operate with relative impunity in the background. Having said that, I can see the benefit of gathering like-minded people towards a common goal. It is the implementation of the model that is not working at present. Brazil next year. By the beach! The point of the multi-stakeholder model is what preceded it, and what is still being offered as an alternative. Which is the single stakeholder model – government is the stakeholder, it allows in select lobbyists, and excludes civil society, and anyone else they don’t explicitly permit, entirely. Sure, multi-stakeholderism is slow, unwieldy, and in many ways we are still learning to do it well. But it sure beats having the decisions made it a government controlled process that you are not permitted to be part of, or even learn about (eg the Trans-Pacific Partnership Agreemet process). Yes lobbyists are involved, but lobbyists are the voice of stakeholders – we should not trying to exclude them, but turning them from back room lobbyists into advocates. Openness and transparency and seeking consensus (which means minority involvement and assent is needed) is the methodl. Oh, and it sounds facetious, but its not intended to be – the most important decisions about mass surveillance will be made at the IETFs multistakeholder meetings, as they work to put secure crypto into as many protocols as possible – and we know the NSA and GCHQ go to *those* meetings. Dave, I honestly didn’t know that the NSA and GCHQ participate in IETF. If they are participating in good faith, how does that explain what we have learned since Snowden?